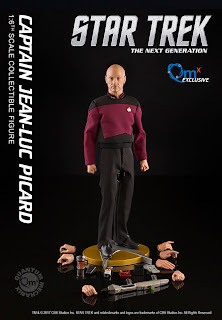 "At noon PDT, Quantum Mechanix Inc. (QMx) will release for pre-ordering the much-anticipated Captain Jean-Luc Picard Master Series 1:6-scale articulated figure. The figure is expected to ship in May. Our Captain Picard figure has more than 30 points of articulation, allowing him to be displayed in a number of dynamic poses. He features an authentically styled Star Trek: The Next Generation uniform with simulated leather boots and detailed 24th century accessories, including a phaser, communicator badge, tricorder, Personal Access Display Device (PADD) and the Captain’s Earl Grey tea cup. He also comes with multiple hands for a variety of poses and gestures. Picard will be priced at $179.95. An exclusive version of the figure will only be available directly from qmxonline.com and select international distributors. This version will feature an additional phaser rifle and an extra set of hands for holding it. The exclusive edition Picard figure will be priced at $199.95. 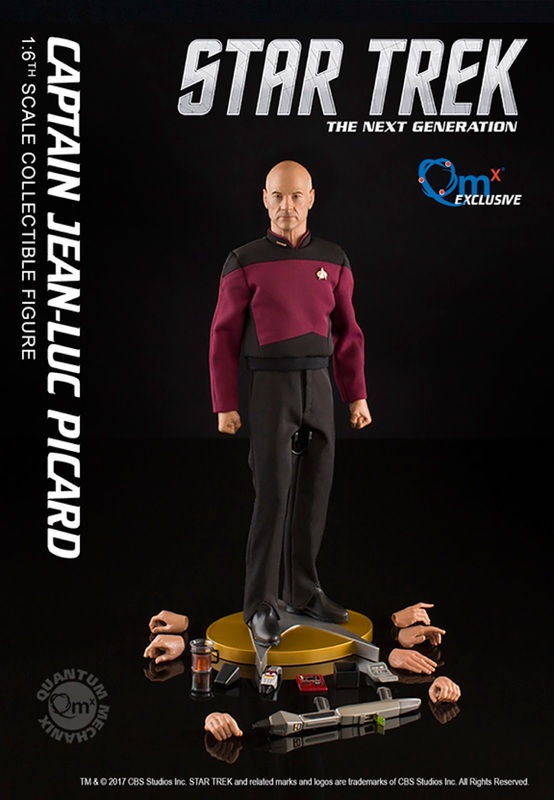 The Captain Jean-Luc Picard Master Series 1:6-scale articulated figure is one of many Star Trek products QMx will be releasing in 2017 that celebrate the 30th Anniversary of Star Trek®: The Next Generation." You know you want your very own Jean-Luc Picard.